Looking for deals in Stockholm? Elite Hotel Carolina Tower is located in Hagastaden next to the Karolinska Institute and Karolinska University Hospital. The staff is very professional, the breakfast is outstanding, the rooms are clean and extremely quiet. Nothing negative to say at all. 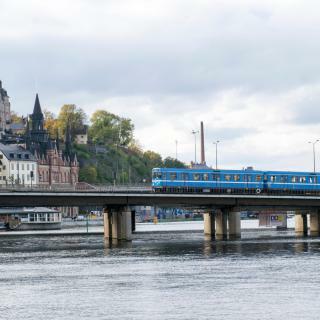 Downtown Camper by Scandic is centrally located in Stockholm, just 8 minutes' walk from Stockholm Central Station. The bed was really comfortable and the relaxation area on the top floor was amazing. Also really enjoyed the meditation session in the net. Also the food was really good and they had a lot of vegan alternatives. This modern design hotel is centrally located in Stockholm, and features a restaurant with international cuisine, wine bar with outdoor terrace and a well-equipped gym open 24-hours. Everything. This hotel is beautiful and centrally located. Great restaurant with excellent food. On our first night we could hear the noise from the rooftop bar but upon reporting this to the front desk the manager Christina and maya helped us out right away and moved us to a quieter room. Best hotel experience during our trip to Scandinavia. We would definitely stay here again. This trendy hotel is located 1 floor below the popular Urban Deli restaurant and marketplace in central Stockholm. everything in the hotel was beautiful , underground hotel with beautiful modern interior design and amazing atmosphere, great staff and central location . The family-owned Hotel Hornsgatan is located in the trendy Södermalm district in Stockholm, 492 feet from Mariatorget Metro Station. It offers rooms with cable TV and free WiFi. Excellent place with excellent staff, service, and ambiance. This luxury hotel is next to the Stockholm Waterfront Congress Center and the Central Station. It offers free Wi-Fi and gym access, fine dining and panoramic city views. The location is fantastic. The breakfast was very good. So many choices. This hotel is 2 minutes’ walk from Drottninggatan shopping street in central Stockholm. It offers modern and tastefully decorated rooms with a flat-screen TV, bathrobes and free WiFi access. The front desk staff was outstanding. Hellstens Glashus is located in the vibrant Södermalm district in Stockholm. Gamla Stan, Stockholm's Old Town, is a 15-minute walk away. Everything exceeded my expectations and i was really impressed with the food menu offered. Set in an 1880s building, this stylish hotel is 492 feet from the Arlanda Express Airport Train and Stockholm Central Station. It offers free WiFi, gym, sauna and bike access. Super comfortable bed, all the necessary items in the room incl coffee machine. Best Western and hotel offers modern and compact accommodations in central Stockholm. The hotel has a fitness center with a sauna, while food and refreshments are offered at the restaurant and bar. Great location, super comfy bed, stylish bathroom, good selection at breakfast. A satisfactory stay. Located less than 10 minutes' walk from Stockholm Central Station, this hotel offers free WiFi, an on-site lounge bar, as well as modern, well-designed rooms. Second stay in this hotel. Staff and checkin/out is friendly, helpful and easy. Castle House Inn is located right in the heart of Stockholm's Old Town, only a 3 minutes' walk to the Royal Palace. Free WiFi access is available. This is a fantastic hostel in the heart of the old city:) My recommendations! Set just 328 feet from Drottninggatan shopping street in central Stockholm, this hotel offers modern rooms with free WiFi and a flat-screen TV. Stockholm Central Station is a 5-minute walk away. Great breakfast, excellent location!!! In the Hammarby Sjöstad district of Stockholm, this hotel provides free gym access and modern rooms with colorful décor and 40-inch LED-TVs. Mårtensdal Tram Station is right outside the hotel. Very modern, clean hotel, close to the tram station and to the subway. Surrounded by greenery in north-east Stockholm, this property is 10 minutes’ walk from Gärdet Metro Station. All rooms offer free WiFi, a TV and private bathrooms. Very nice, cozy and superclean place in great neighborhood of Stockholm!!! Best Western Hotel Bentleys is housed in a 18th century building on Drottninggatan shopping street in central Stockholm. Beautiful hotel. Staff was incredibly friendly and helpful. Really enjoyed our stay! Featuring free WiFi, Niro Hotel Apartments is located in Stockholm. The property is set 1.6 mi from Långholmen, 1.7 mi from Stockholm City Hall and 1.9 mi from Sergels Torg Square. Excellent comfort with spacious bath and room. Located by the National Museum, this chic waterfront hotel offers views of the Old Town and Royal Palace. It offers a popular bistro-style restaurant and art exhibitions. Excellent small hotel. Location is fabulous. Walking distance to everything. This central Stockholm hotel is just 656 feet from Sergels Torg Square and 1640 feet from Kungsträgården Park. Everything was great. It was a short stay, but it was comfortable and affordable. Overlooking Humlegården Park, just a short walk from Stureplan Square, this modern designer hotel has a gourmet restaurant and an English-style pub. Guests can enjoy free Wi-Fi, gym and sauna access. The hotel is in a perfect location for exploring Stockholm. This family-owned, stylish is located just 3 minutes’ walk from Stockholm Central Station. The hotel’s popular Belgobaren offers up to 300 Belgian beers. There are so many good things to say about this hotel! Located in Stockholm city center, this hotel is just 656 feet from Stockholm Central Station. It offers free WiFi and quiet rooms with a flat-screen TV and tiled bathroom with rain shower. Ovarall everything was great! Definitely its location and breakfast would be the highlights though. Which neighborhood is the best one to stay at in Stockholm? Södermalm, Kungsholmen, and Norrmalm are popular with other travelers visiting Stockholm. What are the best hotels in Stockholm near Stockholm Arlanda Airport? Travelers who stayed in Stockholm near Stockholm Arlanda Airport (ARN) have said good things about Radisson Blu Airport Terminal Hotel, Clarion Hotel Arlanda Airport, and Radisson Blu Arlandia Hotel, Stockholm-Arlanda. Which hotels in Stockholm are good for couples? These hotels in Stockholm are highly rated by couples: Lydmar Hotel, Bank Hotel, and Hotel Kungsträdgården. How much does it cost to stay in a hotel in Stockholm? On average, 3-star hotels in Stockholm cost $96 per night, and 4-star hotels in Stockholm are $137 per night. If you're looking for something really special, a 5-star hotel in Stockholm can be found for $275 per night, on average (based on Booking.com prices). Which hotels in Stockholm offer an especially good breakfast? 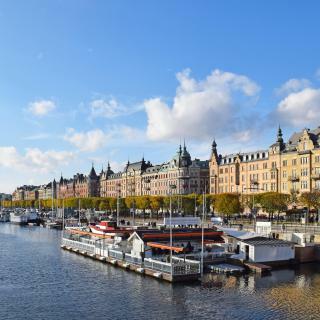 For hotels in Stockholm that serve highly-rated breakfasts, try Hotel With Urban Deli, Downtown Camper by Scandic, and NOFO Hotel; BW Premier Collection. What are the best hotels in Stockholm near Ericsson Globe? Some of the best hotels in Stockholm near Ericsson Globe include Quality Hotel Globe, Motel L and Biz Apartment Hammarby Sjöstad. Which hotels are the best ones to stay at in Stockholm? Grand Hôtel Stockholm, Hotel Rival, and Downtown Camper by Scandic are some of the popular hotels in Stockholm. Which hotels in Stockholm are good for families? Many families visiting Stockholm loved staying at Hotel Hornsgatan, Lydmar Hotel, and Hotel With Urban Deli. Which hotels in Stockholm have nice views? 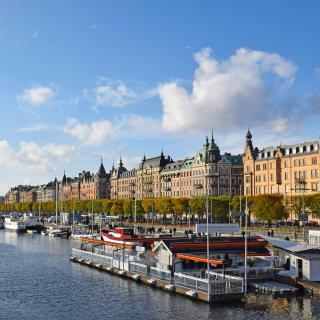 Hotel Skeppsholmen, Lydmar Hotel, and The Studio Hotel got great room view-related reviews from travelers in Stockholm. How much is a hotel in Stockholm for tonight? On average, it costs $108 per night to book a 3-star hotel in Stockholm for tonight. You'll pay around $152 if you choose to stay in a 4-star hotel tonight, while a 5-star hotel in Stockholm will cost around $254, on average (based on Booking.com prices). How much is a hotel in Stockholm for this weekend? The average price per night for a 3-star hotel in Stockholm this weekend is $209 or, for a 4-star hotel, $269. Looking for something even fancier? 5-star hotels in Stockholm for this weekend cost around $532 per night, on average (based on Booking.com prices). Modern Stockholm is uniquely made up of 30% waterways and another 30% of parks and green spaces. It’s spread across 14 islands and is both one of the world’s cleanest and most charming capitals. Stockholm’s famously huge number of museums includes the Naturhistoriska riksmuseet, the Moderna Museet and the Spritmuseum. City Hall hosts the famous Nobel Prize banquet and the Vasamuseet hosts the 300 year old Vasa warship. The city’s past can be felt in Gamla Stan – Stockholm’s stunning Old Town with medieval layout, cobblestone streets and the Baroque-style Royal Palace. Designer Swedish clothes and interior decorations abound in the many unique stores throughout the city. For a day away, ferries reveal the stunning Stockholm archipelago, a group of thousands of islands and rocks where you can enjoy hiking, outdoor swimming and fishing. Whether you fly to Arlanda, Bromma, Skavsta or Västerås Airports, the city center can be reached by either train or airport coach. Booking.com offers a wide choice of accommodations for your Stockholm holiday, from modern hotels, to unique motels and affordable hostels. Stockholm is a beautiful wide open city with a lot of green spaces and water all around you. We were able to walk from the Grand Hotel to many sights including the photography museum (a fantastic place with a great restaurant) and the modern art museum. The dock for boat tours around the city was right across the street from our hotel and we took a tour of the inner city called "Under the Bridges " on our first day there. There are a lot of interesting museums and plenty of sights to see. I never realized that Stockholm is really made up of many islands . The food in Stockholm was very good , especially the fish. There are a lot of top restaurants . One thing to note is that a lot of the dishes are prepared with cream based sauces . I'm not a fan of cream in my food so I had to order very carefully. The arctic char was on the menu in many restaurants and was delicious. A favorite place for foodies to visit is the Ostermalms Saluhall which is a fun place to go for lunch. Lots of seafood can be found there . I recommend Stockholm as a wonderful relaxing place to visit! Stockholm is a gorgeous city; you should spend several days there to really get the full experience; be prepared to walk a lot- parking is extremely expensive and limited. It's so easy to get mostly anywhere you want by walking. Be sure to visit Gamla Stan, the old town. It is very historic. The boat tours under the bridges are so-so... they are very informative, though if you're looking to learn about the history of the city. Plan for an entire day at Skansen... not just a few hours. Be sure to visit the Vasa Museum, the Royal Palace and Djurgarden. The city is history-packed and there are endless places to dine. It is, simply put, breathtaking. You can expect, however, the hotels to be pretty small for what you're paying... it is very unlike America where, for a cheap price, you can get a spacious room. Everything is tightly packed and smaller, but that's Europe! Enjoy, and make sure you set aside a day to relax there-- have a leisure day where you can just enjoy the city and photograph it. Go on the hop-on hop-off boats as you can enjoy the Vasa Museum and the ABBA museum and see parts of the city from the water. Then get off at the Grand Hotel and have lunch or walk the warf to old town for lunch or dinner. All of the Gov't buildings are between the hotel and old town. We were there for three nights. Beautiful old city with canals running through separating the new establishment from the old (Gamlastan). 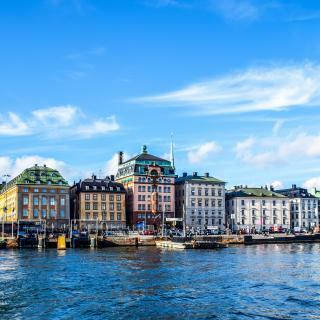 City Hall, Museums, Palace, walk by the harbour, walk through the old city and other islands, walk inlands, easily accessible public transport and great restaurants makes this a must visit Scandic city. Late night walks by the water from one island to the other or a late night coffee/dessert break in the Grand Hotel cafe after and before a long walk savouring the night view is a walk to remember. Things to be aware of.. - Bike friendly city... can rent bicycles and traverse the entire city but nust know the traffic rules which are not difficult to figure out.. - Always have multilayered clothing available as nights can get very chilly though the day maybe warm. - Always have good walking shoes on. - If staying in a big hotel ask for top floor quiet rooms with a view beforehand. The city maps given at the hotel are not accurate. - Always ask the local people. Local people are very helpful, friendly and speaks English. - Roads are multilayered. Always stay on the road that is being traversed by pedestrian.. there isa reason they are not on the other level... the underground level usually is used as a docking area and does not provide an entrance to the building even if you are standing right underneath it.. and it could be a long walk tot he entrance. - Best fish restaurant is Stockholm Fisk. We ordered from the menu different dishes with different fish rather than the popular seafood platter that most of the people were getting and this provided a unique opportunity to taste these rare delicacies not available elsewhere in the world. We had barely a day and a half in Stockholm. We loved strolling around the houses at the Skansen openair museum and then being able to walk to the Vasa museum from there. The island they're on is such a beautiful and quiet area. The public transport in Stockholm seems to be exceptionally good - it seems to be really easy to get anywhere. We ate one night at a restaurant called Kryp In (Prästgatan 17) near our hotel (Lady Hamilton) that seemed to be a favourite of the locals. It was crowded, and cosy and friendly, good food and generous with wine. Unbeatable value for money in Stockholm. Everything in this hostel is impressive. Their organization, the very well thought design of rooms, how many guests they handle at once (very efficiently)... I could go on forever, really. 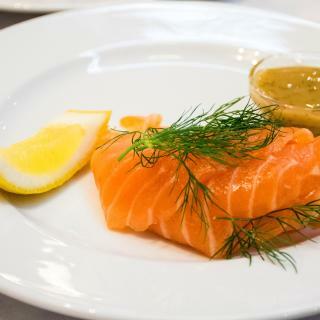 They offer an immense variety of food for all meals at reasonable (Scandinavian) prices. I’ve stayed in other hostes in town and this is definitely the best. Book it, you can’t go wrong. The hotel feels like a home, the room smelled like cleaned freshly ironed sheets. The bathroom is very clean and the owner and staff extremely nice. The best part is that you can have free coffee and drink it in front of the hotel on a little terrace right next to the Nobel Museum in the most famous square in Stockholm where a coffee at the terrace is around 10 euro. Fantastic hotel! Loved it! Best Western : The hotel is definitely recommended. Even though the check in time was 2pm, we were alowed to check in at 1pm. There's 2 grocery stores very near this hotel. The nearest subway station Odenplan is about 7 to 8 minutes walk. There's also a restaurant on the ground floor of this hotel. The breakfast has got a good selection and is definitely recommended. Comfortable beds. Breakfast is good. Service is really good they work hard to pleasure the guests. Metro station is nearby to Stockholm city center. You can buy a 24 or 72 hour pass in hotel for transportation (bus/metro/ferry) it was really good to have that opportunity. I would recommend this hotel. Nice place to stay. Excellent hotel, very good location as it is in the walking distance to the most of sights and the central station (10 mins), though it was hard to find that specific Scandic hotel as there are so many of them in the city. One of the best breakfasts I've had. Very clean and good value for money. I would definitely come back. Great Location. Lovely decor. Friendly and very helpful staff. Possibility to sit at the balcony was super! Comfortable beds. It was nice to have tea/coffee/fruit available 24/7. Deluxe room was absolutely stunning. Our best hotel experience in Stockholm so far - we will probably be back! There room was spacious and beautiful and very quiet to sleep at night. The hotel is located in the south of Stockholm, near to cute little bars and restaurants and a great shopping district! Plus... the breakfast! Do it! It’s so worth it! Best breakfast i’ve ever had! Fabulous! Everything was perfect. A very modern hotel in a 1600 barracks. A quiet country inn feel, in the middle of bustling Stockholm. The restaurant is wonderful, staff, rooms, location, grounds, accessibility, are all the best! Room was clean. Although not located in the city center, it’s quite convenient to go around the city of Stockholm. You can take the ferry just outside the hotel. The breakfast was one of the best I’ve ever had! Beautiful hotel, small but cosy rooms, very comfortable bed, the heating in the bathroom's floor is the best. 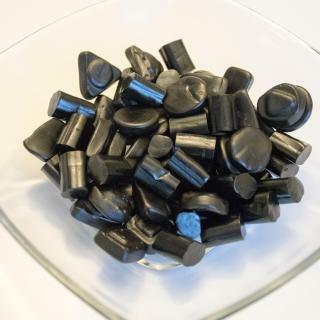 Good vegan choice for breakfast. Nice position in Stockholm near the railway and bus station. The best 3-star hotel that I have ever been!!! I was in Stockholm for a business trip and it was exactly what I was looking for. The hotel is placed in the same building with the hospital. Fabulous family owned hotel in the centre of Stockholm, 5 min walk from Gamla Stan. Best hotel breakfast I’ve had so far I can remember and great staff. Wouldn’t hesitate coming back! It am glad that I have chosen this hotel. This is the first time that i went for a Best Western hotel and from now on, I think I will be booking a room in this hotel in any city. Everything was great. Staff were super. Always smiling giving their best to serve all our requests! We are looking forward to return to Stockholm and to this wonderful hotel! Perfect location! I lived in 3 Hotels/Hostels in Stockholm and this was definitely the best one... Nice staff, nice room and bed. Breakfast was good. Location in heart of Södermalm was great. Best part of Stockholm hands off. It wasn't the fanciest hotel, but very good value for the money. Location is the best in Stockholm and the staff is nice. Breakfast was also good and the rooms were good. Also very fast WiFi.